I discovered babywearing 15 years ago. As a first time parent with a 6 month old and like many first time parents and caregivers, I often found myself unsure if I was doing everything right. When my baby got sick for the first time, a very sweet friend taught me to use a woven wrap and within minutes my oldest son went from inconsolable screaming to calm and sleeping. I just knew babywearing was going to be huge part of my parenting from then on. Since then, I’ve watched a babywearing community develop and grow and my methods of parenting have evolved as well. I now have 3 children and I’ve learned there isn’t a single right way to parent. There is simply the best way for every family and every child and parenting is a lot of trials to finding that best way for each of us. 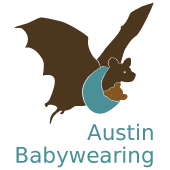 I have worn all my children and each has been worn for longer than the last as I have become more aware and knowledgeable about the benefits of babywearing. My youngest son has made me more aware of how amazing babywearing really can be and pushed me to learn more and volunteer as an educator. As he approached toddlerhood, I started noticing some concerning behaviors and developmental delays. 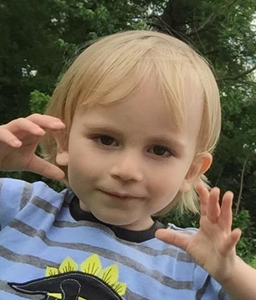 He’s 3 ½ now and has been diagnosed with sensory processing disorder and mixed receptive/expressive disorder. 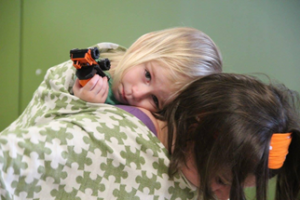 Babywearing with my older 2 children was very much about closeness, convenience, and safety. With my youngest, it has become a therapeutic tool for the most part. We use babywearing as an alternative to deep pressure therapy and in helping him to develop his verbal skills. When his therapists gained interest, I decided to research further and connect some evidence to my practice of this technique. Deep pressure touch has been proven to increase endorphin levels, lower heart rate, and lower blood pressure as well as release serotonin and dopamine in the brain. (1) Babywearing can provide deep pressure touch and have a calming effect for children with sensory issues, anxiety disorders, autism spectrum disorder, ADHD, etc. The same effects may also be effective for a caregiver who is babywearing. In addition to the tactile response of squeeze touch and textures provided by the carrier itself, babywearing provides safe touch and closeness to a trusted caregiver. Certain carriers result in a negative response from my son because of undesired texture or fit. A woven wrap, ring sling, or sometimes even a wrap strap meh dai seem to be most effective because of their versatility and the ability to tighten more across his torso or other areas of his body as needed. I try to keep an eye out for overstimulation and put my son up in a carrier before it becomes too much for him. Distraction is often a useful method and one of his favorite games for distraction is “seeker eyes.” This is where the verbal stimulation comes into play. By wearing my son, he is at my level and we have the same view. I can also make my voice louder than the sounds around us so he can focus on my voice rather than the negative stimulation in the background. When I know something is coming that has the potential to overstimulate, I’ll say, “Seeker eyes! What do we see?” We both put our hands up to our eyes as if we are holding binoculars and discuss what we see, colors, shapes, animals, etc. His therapists have found this method particularly promising for distraction and expressed how they are starting to use this game with other patients as well. On a walk, I hear a train in the distance. I know it’s going to get closer and louder. We play seeker eyes and as the train passes, my son is so distracted by looking for objects and listening to my voice that he barely notices the train. Water carriers may be particularly helpful for children with an aversion to water. We regularly use a water carrier for bathing, a trip to the splash pad, or swimming. Our personal favorite is a water ring sling because we can flip the tail up over our heads and hide from the world around us. There are also plenty of other options as well and we have quite a few in our library if you are interested in trying some of those options for yourself. Lastly, there is this pretty amazing benefit to babywearing and particularly in owning woven wraps. 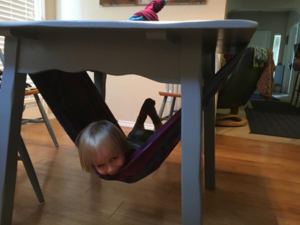 Wrap hammocks! It is the perfect sensory play combination of textural stimulation and self controlled movement. Just be sure if you try this, you do this on a very sturdy table with very smooth edges so you don’t damage your wrap or your table. And absolutely make sure you have a solid double knot if you try this (square knot is preferable to avoid slipping) and supervise to be sure your child is safe. As much as these techniques can be helpful with children who have special challenges, the benefits can be applied to all children. The many sensory challenges of our adult world can be difficult for any children at times. In celebration of #babyweartothrive day, we want to thank Marie for sharing her story and helping bring awareness to babywearing children with special needs. Wilbarger, P. &Wilbarger, J. (1991). Sensory Defensiveness in Children Aged 2-12: An Intervention Guide for Parents and Other Caretakers, Avanti Educational Programs: Santa Barbara, CA.